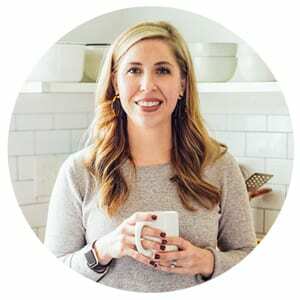 After my family made the switch from processed food to real food, I began to rethink the products we used in our home and on our skin. If you’ve been around Live Simply for any length of time, then you’re probably very familiar with our story. Honestly, I never once thought that making such drastic food changes would later lead to an entire overhaul of my cleaning and bodycare routines. Even though that wasn’t ever my goal–a complete lifestyle overhaul–it happened slowly over time, and the transition was quite natural. Literally, natural. How exactly can I get my cutting boards clean without bleach? What about my toilet? Yuck! How do I get my toilets clean and odorless without the help of those famous scrubbing bubbles? What about my kitchen sink? How do I clean and disinfect my kitchen sink without that metallic green can? 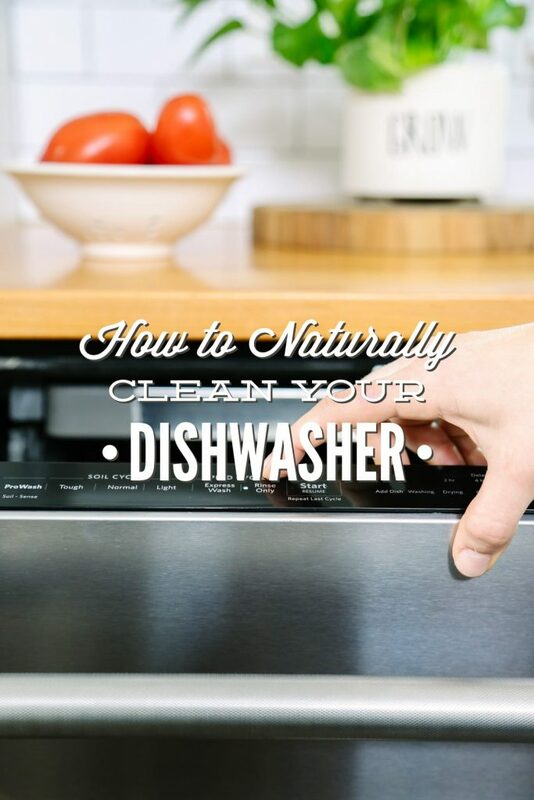 Today, we’re going to dive into another very practical natural cleaning how-to by focusing on cleaning the dishwasher. It probably sounds a bit crazy to clean a dishwasher, right?! Isn’t a dishwasher the tool we use to clean dishes, silverware, and pots and pans? Why does a tool designed to clean need to be cleaned? I hear ya! I felt this way, too. But here’s the thing: the dishwasher is probably the hardest working large appliance in the entire kitchen, besides the oven. On any given day, the dishwasher can be exposed to everything from grease to food particles. Day after day of this kind of exposure can lead to a major germ and bacteria party that puts the best college parties to shame. All of this exposure means that you need to give the dishwasher a bit of cleaning TLC every so often. I clean our dishwasher once a month. Sometimes, I’ll clean it every two or three months, just because life gets busy. When our dishwasher receives extra cleaning TLC, I’ve noticed that it works better. My theory is that even if you can only dedicate one day (which takes about 30 minutes of time) a year to cleaning your dishwasher, your dishwasher will thank you. And one side note. 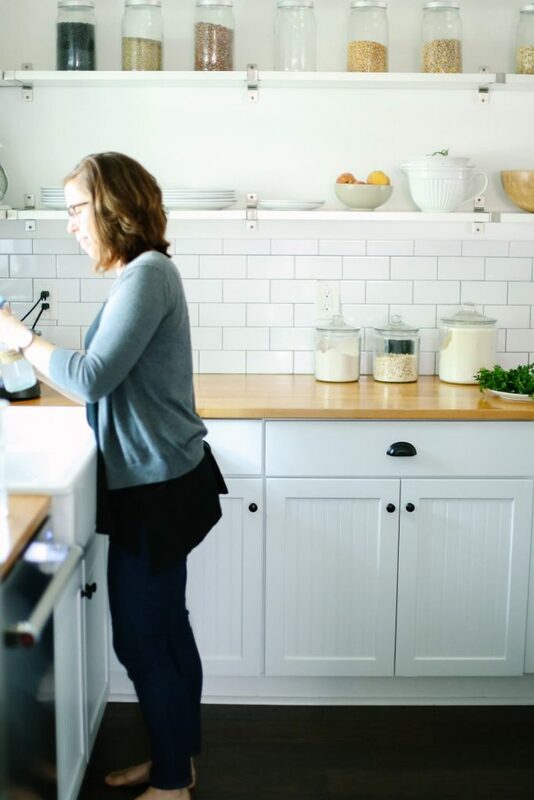 If you don’t have a dishwasher, then you’ll probably want to skip this how-to tutorial and head over to my How to Naturally Clean Your Kitchen Sink post, since your sink probably needs a bit of extra TLC due to all the hand-washing. If you didn’t read your dishwasher manual (raises hand), then you may not know that there’s an important part, actually two, at the bottom of your dishwasher basin. Let me introduce you to the filter. This guy has the very special job of catching food, sand, dirt, and anything else that may rinse off your dishes and silverware. 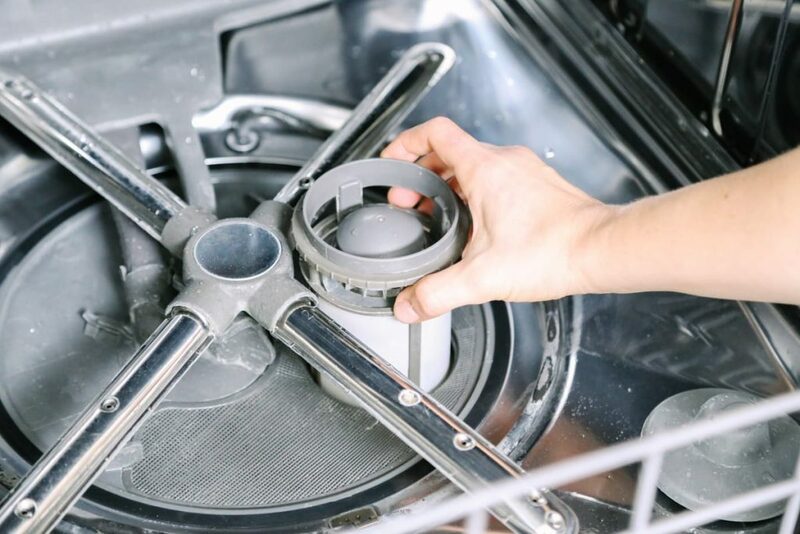 If you’ve noticed that there are food particles on your dishes, and they just aren’t fully clean when you remove them from a wash cycle, then your filter is probably blocked and screaming out for some cleaning TLC. To remove your filter, simply lift it out of its home at the bottom of your dishwasher, and then remove the mesh filter. 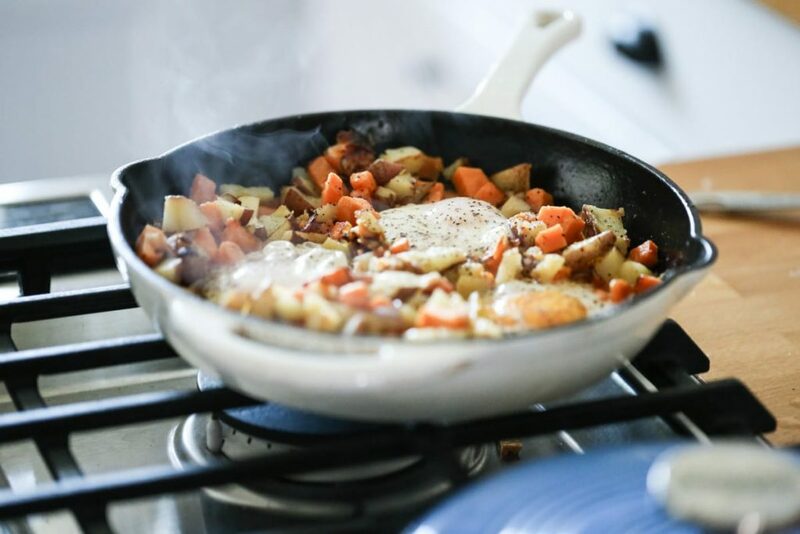 Discard any loose food in the trash, and then fill your sink with hot water, so the water is just high enough to submerge the filters, and then add some white vinegar. I usually add about 1/2 of vinegar and a few drops of Sal Suds (I don’t recommend using castile soap), depending on how dirty the filters are. You could probably get away with just using Sal Suds, if you want to conserve on vinegar. Let the filters soak for about 30 minutes, and then gently scrub them with a scrub brush, or sponge, under hot water. Gentle is key!! Do not break the filter. If you don’t have time to soak the parts, then simply spray them with vinegar and/or wash them with hot soapy water. The goal is a clean, grease-less filter. Once the filter is clean, place the filter back in the dishwasher. Before doing this, you may want to check in the hole of the filter to make sure there isn’t any food stuck down there. Now that the filter is clean, let’s crash the germ and bacteria party that’s currently taking place in your dishwasher! 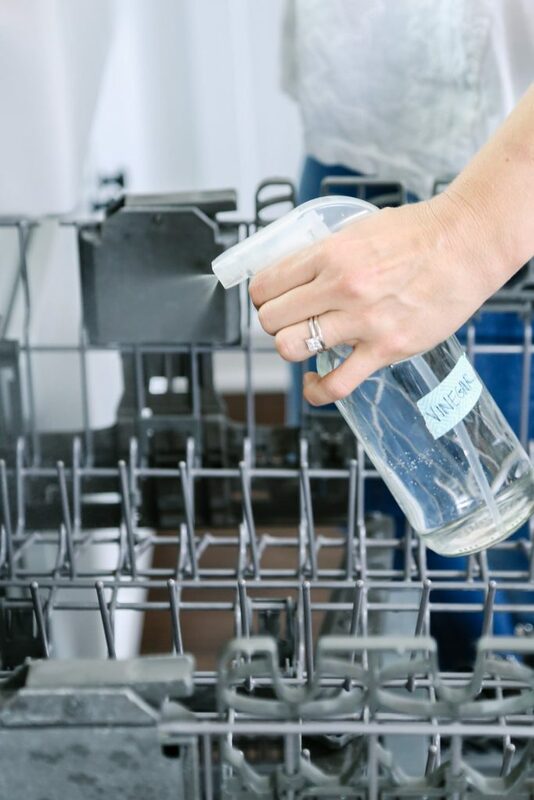 First, use the vinegar spray to spray down the racks of your dishwasher. Use a scrub brush to scrub the racks. If the exterior gasket looks gross, gently scrub it or wipe it down with a sponge. 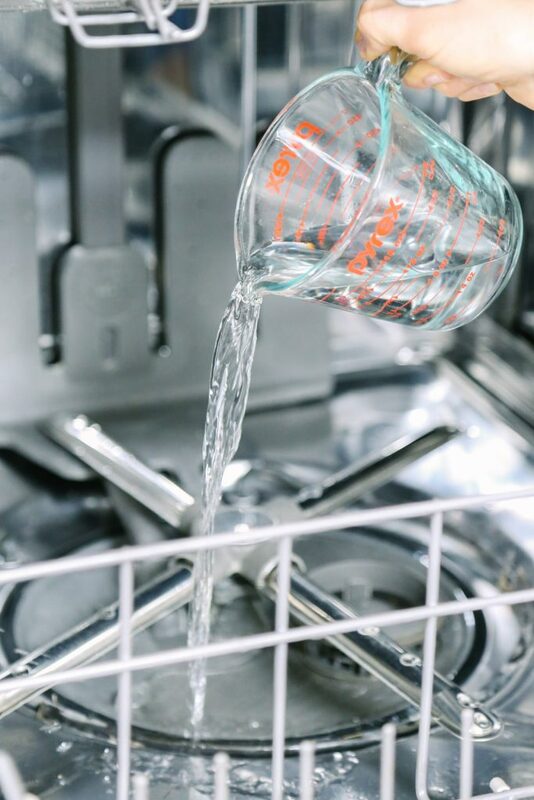 With the filter back in place, pour 1 cup of white vinegar in the bottom of your dishwasher. 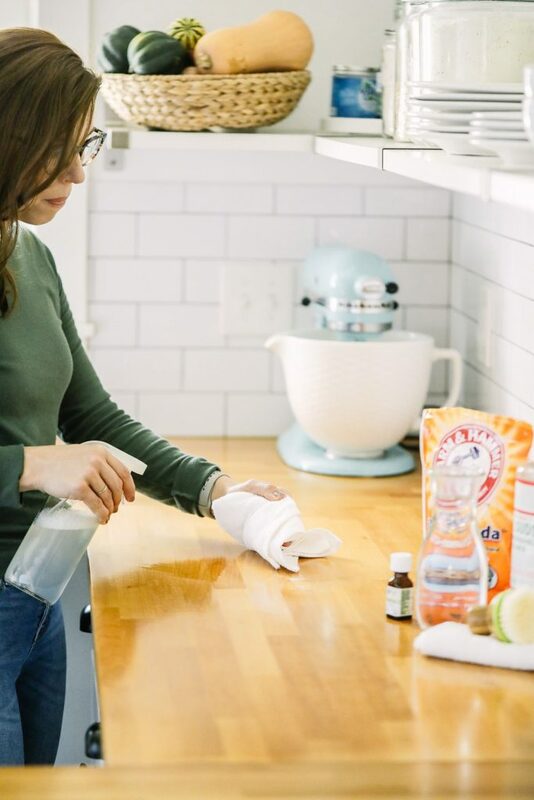 If you’d like to add a few drops of grapefruit, lemon, orange, or even tea tree essential oil before pouring the vinegar in the basin, go ahead and add it to the vinegar. Now close the door on your dishwasher, and run it through a full cleaning cycle. If your dishwasher could send you a giant heart emoji text right now, it would. Just know that your dishwasher is extremely thankful for the natural cleaning TLC. It promises to work extra hard for you! While I’m caring for the dishwasher, I spray the outside with All-Purpose Vinegar Spray, and then wipe the exterior clean with a microfiber cloth. PS: This is how I clean my dishwasher. As always, whether you’re using store-bought cleaners or do-it-yourself products, it’s always best to do your own research and consult your appliance manual. I totally agree that the dishwasher needs to be cleaned! I actually cleaned out the filter out about two months ago and cannot believe how gross it was! I will be cleaning my dishwasher this way next time I empty it! Thanks Kristin! Hey Terry, I was horrified the first time I cleaned our filter–yuck!! Who knew there was something so dirty and greasy hiding in my kitchen, lol. Thanks for the great tutorial. I will definitely have to give this a try. Gotta love good ol’ vinegar. I have a question totally off the topic. 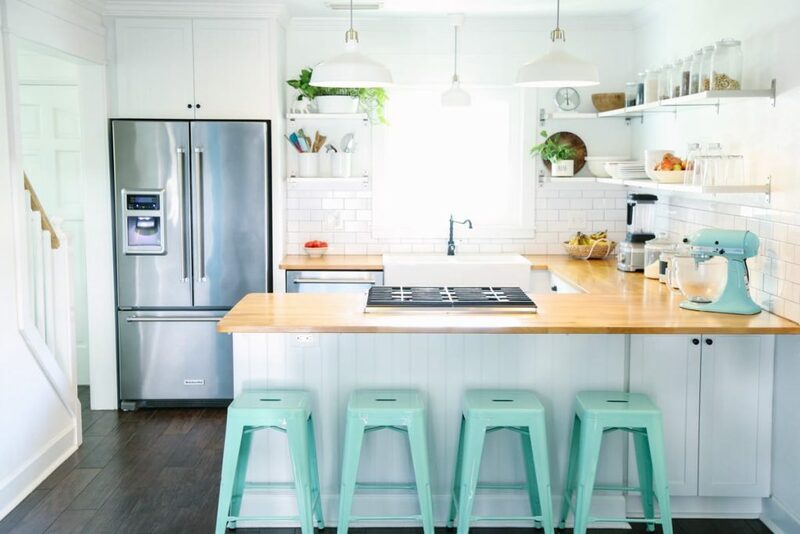 Are those stools the ones from Ballard’s Designs? I’m a little, ok a lot in love with those. I was curious if you like them and if they are holding up well? Thanks again! Hey Barb, Our stools are from Target: http://www.target.com/p/carlisle-24-counter-stool-metal-set-of-2/-/A-14604480. They don’t carry them in stores, just online. We ordered a few different colors to try each one out, and decided on the mint color. Thankfully, Target stores take back online purchases, lol. We absolutely love them! They are super easy to clean and very durable, even with kids :). Enjoy the clean dishwasher :). Thanks for the tutorial. I can see from the picture that you have a stainless steel dishwasher. Do you use the the All Purpose Vinegar Spray for the stainless steel door?? I have tried so many cleaners for the ss (fridge, oven and dish washer) and I haven’t found anything what really cleans them shiny and without marks. Hey Petra, I do! I’ve found that it works really well on the outside of my dishwasher–just the vinegar and water. I use a microfiber cloth, too, which really helps cut down on streaking. After reading your article and cleaning my dishwasher, (I was especially appalled by the filter), it seems to be working fine. Thanks so much. Hopefully this simple, very important task will save quite an expense. Hey CarolSue, Yikes, I’m so glad to hear it’s working right now. I hope cleaning the filter helped out :). I just found “you” yesterday and have read loads of you DIY and love it! I have made my own laundry for a few years. There was concern about borax. You need to read “The borax conspiracy” then you will know it’s ok and why it is marked as poison. I have RA and do the borax conspiracy, much better than when I was on prescribed meds. Hey Dorothy, Welcome to Live Simply! Thank you for the reading recommendation–I’ll check it out! Have any recommendations for a natural dishwasher tab substitute? Hey Steve, I have a recipe in my cleaning book that can be turned into tabs by placing them in silicone molds and letting them dry out on the counter. For a store-bought dishwasher tab, I like Seventh Generation. Sadly see that products with known toxic ingredients are advertised here . . .
Hey Claude, I’m not sure the specific products you’re referring to. Maybe Sal Suds? Here’s more information for you: http://www.lisabronner.com/there-is-no-cancer-risk-from-sls-sodium-lauryl-sulfate/. What do you use to clean your dishwasher and house? I always love to hear what’s working for readers.